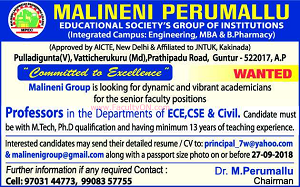 Malineni Perumallu Education Society's Group of Institutions, Guntur has advertised in THE Eenadu newspaper for recruitment of Professor jobs vacancies. Interested and eligible job aspirants are requested to apply on or before 27th September 2018. Check out further more details below. Name of the College : Malineni Perumallu Education Society's Group of Institutions,Guntur. About College: Malineni Perumallu Educational Society's Group of Institutions is established in the year 2009. It is a self financing institution which owes its foundation to the bold and inspired vision of Malineni Perumallu Educational Society, Singarayakonda. It is the 1st Integrated Campus in Andhra Pradesh. The institution is ideally located in a vast expanse of 35 acres of land on the out skirts of GUNTUR city at a distance of about 6 Kms from the city centre. The departmental buildings are located in close proximity each other with wide open spaces all around. The playfields and other student and staff amenities are within working distances from the faculty blocks. How to Apply: Interested and eligible candidates are requested to send their CV along with copies of certificates and recent passport size photos to the following email address.